This morning, Kady thought breaking up with Ezra was the hardest thing she’d have to do. This afternoon, her planet was invaded. The year is 2575, and two rival megacorporations are at war over a planet that’s little more than an ice-covered speck at the edge of the universe. Too bad nobody thought to warn the people living on it. With enemy fire raining down on them, Kady and Ezra—who are barely even talking to each other—are forced to fight their way onto one of the evacuating fleet, with an enemy warship in hot pursuit. But their problems are just getting started. A deadly plague has broken out and is mutating, with terrifying results; the fleet’s AI, which should be protecting them, may actually be their enemy; and nobody in charge will say what’s really going on. As Kady hacks into a tangled web of data to find the truth, it’s clear only one person can help her bring it all to light: the ex-boyfriend she swore she’d never speak to again. Told through a fascinating dossier of hacked documents—including emails, schematics, military files, IMs, medical reports, interviews, and more—Illuminae is the first book in a heart-stopping, high-octane trilogy about lives interrupted, the price of truth, and the courage of everyday heroes. Raise your hand if you love winning things! 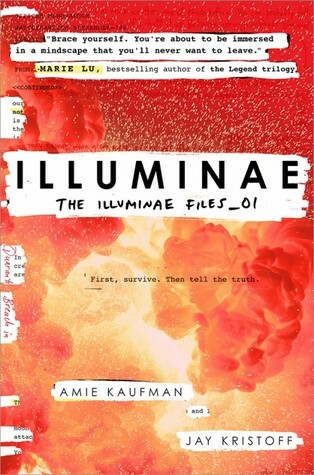 I know I love winning things and this time the odds are in your favor as I have not one but TWO count them TWO copies of Illuminae by Jay Kristoff and Amie Kaufmann to give away thanks to Penguin Random House Children’s Publishing. Whoa, that’s quite the mouthful. Why should you enter this contest? My review says it all right here. I’m reading The Historian by Elizabeth Kostova and Oliver Twist by Charles Dickens. I seriously can’t wait to get my hands on this book. It just sounds so wild, and i’m not normally one to like books that aren’t written in prose but this has very much captured my interest! Thank you for such an awesome giveaway April! This book sounds so exciting! I cannot wait to read this book. Right I’m reading Lair of Dreams by Libba Bray. I’m currently reading The Lies of Locke Lamora by Scott Finch. It’s…interesting so far. I’m actually not reading anything right now – looking for something new! I am currently reading Crush by Nicole Williams! Thanks for the giveaway! I’m currently reading Along the Infinite Sea by Beatriz Williams. I’m reading The Iron Trial by Holly Black & Cassandra Clare. I’m currently reading LIFEBOAT CLIQUE! Alice Lionel recently posted..Spooky Halloween Reads for October!